We are the only ones supplying the thermostat o-ring along with the larger gasket. 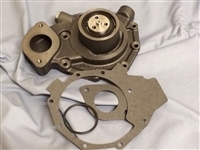 This is a new Water Pump. 5605, 5705, 6100, 6110, 6120, 6210, 6215, 6220, 6230, 6310, 6320, 6330, 6403, 6405, 6410, 6415, 6420, 6430, 6603, 6605, 6615, 6715, 7130, 7210, 7220, 7230, 7320, 7330, 7410, 7420, 7430, 7505, 7510, 7515, 7520, 7610, 7710, 7720, 7810, 7815, 7820, 7920, 5065M, 5075M, 5085M, 5095M, 5095MH, 5105M, 6100D, 6110D, 6110L, 6115D, 6125D, 6130D, 6140D, 6210L, 6220L, 6310L, 6310S, 6320L, 6410L, 6410S, 6420L, 6510L, 6510S, 6520L. Combines: 9540, 9550, 9550SH, 9560, 9560SH, 9580. Skidders: 360DC, 360DG, 460DC, 460DG, 540G-III, 548G-III, 640G-III, 648G-III. Dozers: 450J, 550J, 650J, 700H, 700J, 750J. Excavators: 110, 120, 120C, 120D, 160CLC, 160DLC, 160LC, 200CLC, 200DLC, 200LC, 230CLC, 230LC, 230LCR, 230LRD, 270LC, 270CLC, 690ELC. Bunchers: 643H, 643J, 653E, 653G, 740, 840, 843H, 843J. Loaders: 210LJ, 310J, 310SJ, 315SJ, 330B, 335C, 344J, 410J, 430B, 435B, 435C, 437C, 444K, 444J, 524K, 544J, 544K, 624J, 710J, 2254.Graders: 670C, 670CH, 670D, 672CH, 672D. Sprayers: 4700, 4710, 4720. Cotton Pickers: 9970. Cotton Strippers: 7460.Telescopic Handler: 3215, 3220, 3415, 3420, 3800. Logger: 2054, 2554. Wheeled Harvester: 1070D. In Stock Item ! !